Getting out in the field and seeing plants emerge is the best way to help you better understand crop health and identify yield-limiting threats during the growing season. But managing a farming operation is demanding, and if you have multiple fields, it can be hard to scout every field often enough to see subtle changes that can lead to big problems down the road. Fortunately, you can get ahead of potential issues across all your fields before your yield is impacted through satellite imagery in the palm of your hand. This way, you can get a bird’s-eye view of lower performing areas in the field that you couldn’t see with the naked eye, enabling you to get out there and take action early-on. As a remote-sensing scientist at Climate, it’s not only my job, but a passion of mine to make scouting and decision-making activities easier for you. My team has been working hard to help farmers in their efforts to identify crop health issues and areas of stress in-season. We collect data from a variety of public sources and field experiments conducted on our research farms that span across 35,000 acres in 20 U.S. states, and we ingest millions of these data points to help quantify soil and crop properties across various growth stages and hybrids; along with planting, water and fertilizer management practices. Through detailed analysis of these data sets, blended with various remote-sensing imagery sources, we’ve made some exciting new enhancements to our Field Health Advisor. Through a new proprietary imagery process, we’ve built sophisticated models that use various imagery sources to generate more frequent and consistent images to help you easily identify areas in your field(s) that may need attention. 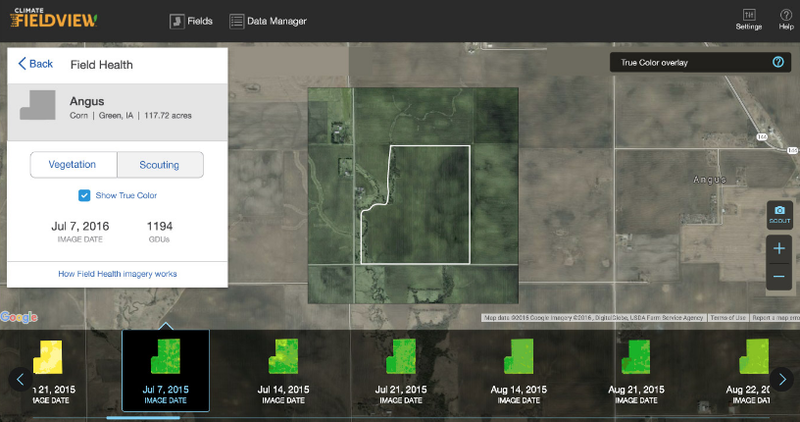 Additionally, we’ve designed a cloud detection model that reduces the impact of clouds on field health images to help you get a clearer view of what’s happening in your fields. We now use more than 250 color shades depicting field-level variability, more than 10 times the detail from our previous version of Field Health Advisor. This will help you quickly identify problem areas in your fields with a more detailed color-scale, reduced pixelation, and a higher degree of clarity and consistency between images. Through our cloud detection model, we’ve reduced the impact of clouds on field health images so you can get a clearer view of what’s happening in your fields and can be confident your scouting image isn’t falling victim to cloud interference. You also can expect more frequent images throughout the season since our cloud detection model continues to generate data even when clouds are present. *Note: You will still receive images with cloud cover so that you can maintain regular visuals of your fields. However, fields with more than 50 percent cloud cover will not be released as these images likely wouldn’t provide enough information on your crop performance to be of value. While our improved cloud detection enhancement helps reduce the impact of clouds on field health images, we unfortunately can’t get rid of clouds altogether. However, True Color Overlay can help you detect if clouds or shadows are infringing on a particular image. This way, you can quickly make an analysis that a cloud was indeed present at the time the image was taken so that you can remain informed. Less pixelation and better color consistency across our satellite providers means more comparable, dependable high-quality field images that enable you to consistently track each field and specifically keep an eye on problem areas throughout the season. 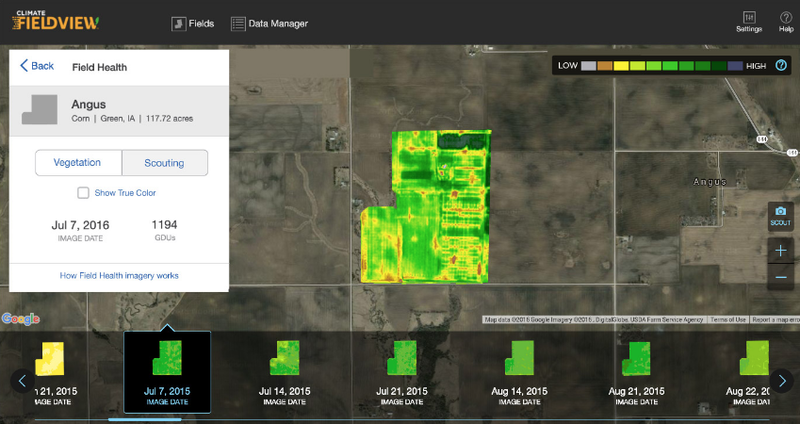 With field health images now available to be viewed side-by-side, right in the cab with other key data layers like hybrid, population, soil and imported maps, you can use current images to visually analyze how your planting plan is coming along, like how a particular hybrid is performing mid-season. New this year, side-by-side view is available in the Climate FieldViewTM Cab app. It will also be available in our full app later this year. While my team continues to work every day to find new and better tools to support on-farm decision making, we think these enhancements to our Field Health Advisor can make a big difference for farmers right now – providing a better tool to support field health. 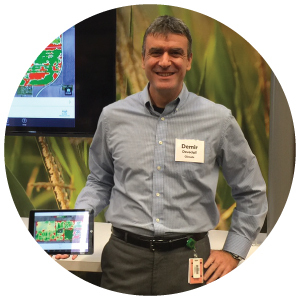 Field Health Advisor is offered as part of Climate FieldViewTM Pro. First-time users of FieldViewTM Pro, can get their first 120 acres free. Farmers can also use the service across their whole operation for as little as $999 for farms up to 2,500 acres. Larger farms can enroll in the service at additional price points. guidance, the geospatial research team focuses on projects that integrate geospatial data with cutting-edge science and scalable models to provide farmers with actionable insights. His team’s research helps drive new tools to enable sustainable agriculture, increase agricultural productivity, reduce crop inputs and improve the lives of farmers. Demir has been working on applications of remote sensing and geographical information systems for two decades. From 1996 to 2004, Demir was the co-founder and technical director of a company that provided geospatial solutions to government institutions in Turkey. After moving to the U.S. in 2004, he started working for a geospatial software development company as a technical manager. Demir joined Monsanto in 2008 and switched his focus to precision agriculture. After Monsanto’s acquisition of The Climate Corporation in 2013, Demir transitioned into his current role.